I saw these Amber beads on a cute little fella a few weeks ago. The first time I saw them I assumed he was wearing his Grandma’s necklace. When I saw him again a few days later, he still had them on. The beads were tucked away in his little white shirt, but I could see a peek of them. I asked her to tell me about his necklace. She was shocked I hadn’t heard about them (as was I after she told me about them). She said her daughter found the Amber beads, and they are supposed to help with pain and inflammation associated with teething. Inflammation of the gums is the main culprit of the fussiness that vengefully appears while a babe is teething. Rabbit Trail...I "cut" two of my wisdom teeth a few years ago, and it hurt like the dickens. I was pretty fussy for a few months. I can absolutely see why our babies act like they're mad at the world and all things in it while cutting their chompers. And to think I didn't even get to keep my wisdom. The oral surgeon decided these ugly creatures needed OUT. I cut them all for nada!! Lets just say I would rather give birth than have my wisdom teeth removed. Thankfully I won't have to do either EVER again. After I told Mark about them he hopped on Amazon and ordered our six month old a dark Amber necklace (heaven knows I've done many, many "new" things that he has suggested over the years!). We didn’t do much research -- just thought we would give them a whirl. I actually did the research after I got the beads, which is a little backwards. Hey...I function on fumes sometimes so give a girl a break. Simple Theory of Magnetism – same, sort of, concept that is used when people wear the copper bracelets for arthritis. Release of succinic acid into the body. Don’t panic -- succinic acid can be found naturally in our bodies, in some foods, beverages, and can be used as an additive. I don’t know about the theories. I’m skeptical, but not enough to keep from trying something that will help my little guy feel better “al naturale”. The critics are very concerned about the choking and strangulation hazards. I can see why. I get it. To me, they seem too short to pose as a teething toy. It seems more likely that a little baby would strangle or choke on her headband and enormous bow filled with sparkly bling before she would on these beads. I will say that my guy is NOT a fussy baby. He has a naturally happy and laid back temperament. I haven’t noticed much difference in the area of fussiness since he typically only fusses when really tired or hungry. 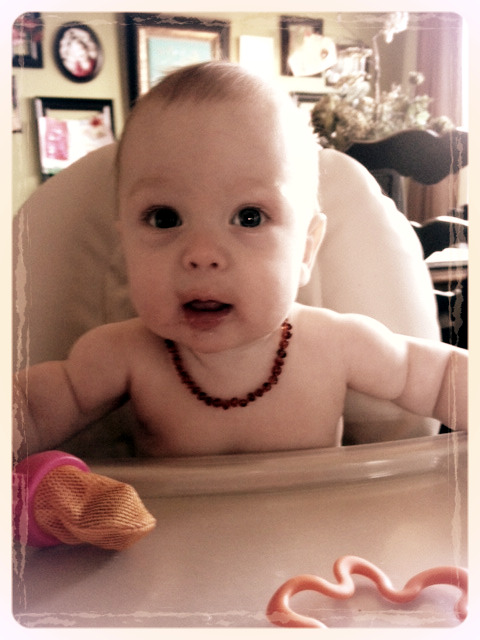 The majority of online reviews will attest to a less fussy baby when beads are worn. I wish I had known about these with my oldest. She fussed when the wind blew, and we live in one of the top 10 windiest cities in America. He naps better with the beads on. When the beads aren’t on we get little 30-45 minute cat naps. When they are on we get two good lengthy naps. I take them off at night because I close his door and rely on a monitor to hear him. During the day I check on him while he naps, and I leave his door cracked or open. It makes me feel better to just have him wear them during the day when I can keep a close eye on him. You will read that they are MOST effective when worn 24 hours. I went halfsies (or more like two-thirdsies) with those rules and just leave on during the day. He doesn’t cry or show signs of pain when chewing on toys or nursing. He drools. He drools more when he’s really working a toy but no signs of that being painful. My girls would bite down on a toy and scream bloody murder when teething. So there ya have it folks, this is my little know nothing experiment with the Baltic Amber beads. I say try 'em if you want or leave 'em if you don't. Please let us know what your experiences are if you do try them.